Log your Kubernetes clusters with Elassandra to get the benefits of powerful scaling and low downtime. Elassandra simplifies your data stack by combining the power of Elasticsearch and Apache Cassandra into a single unique solution. Elasticsearch is by design a sharded master-slave architecture. The Elasticsearch master node manages the mapping changes and only the primary shards take write operations. The replica shards are read-only and can be promoted to primary shards by the master node in case of failure or maintenance. By relying on Apache Cassandra, Elassandra is master-less and has no single point of write. All nodes can process the search requests, request a mapping update, and depending on the Cassandra replication factor, take write operations. As a result, Elassandra is pretty simple to manage with Kubernetes and maintenance operations (like a rolling restart for upgrades) can be done without any downtime. Scaling up or down also becomes a lot more simple, as there is no need to re-index the existing Elasticsearch indices, and only the moved data is re-indexed in Elasticsearch. Elassandra also natively supports cross datacenter replication, between Kuberenetes clusters, for instance. 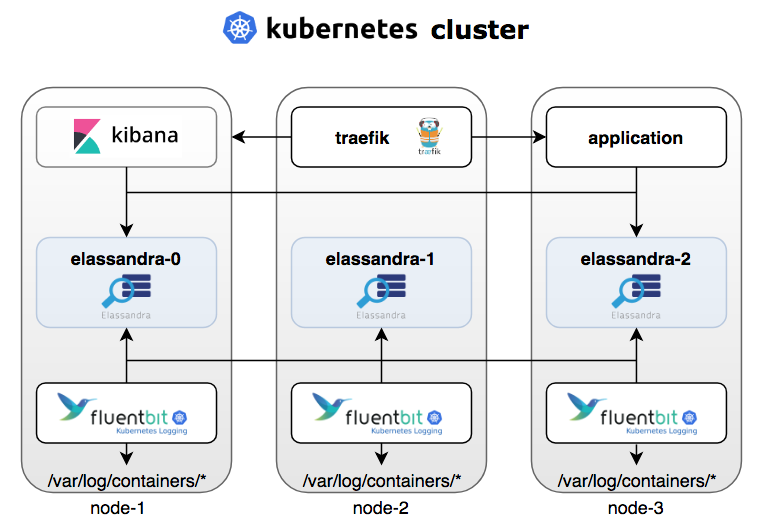 To demonstrate the ability of Elassandra to work properly on Kubernetes, we have used Fluent-Bit, a fast and lightweight log processor and forwarder that supports the Elasticsearch backend, but the same configuration could also use Fluentd or Filebeat. To deploy our EFK stack on Kubernetes, we have used the Helm charts as follows. First, one needs to deploy Elassandra with a 3-nodes cluster with SSD storage (here on Azure Kubenetes Service) from the Strapdata Helm repository. Elassandra exposes an Elasticsearch and an Apache Cassandra service. Third, you need to deploy Fluent-Bit with a specific Elasticsearch index template. This template includes the Elassandra-specific settings to optimize storage and search performances. Once deployed on Kuberenetes nodes, Fluent-Bit starts to send the pod's logs to our Elassandra cluster. In Elassandra, Elasticsearch _source documents are stored in a Cassandra table as rows. When inserting into Elassandra via the Elasticsearch index API, empty fields are populated with null by default in the Cassandra storage layer in order to overwrite any existing documents. It generates some Cassandra tombstones, but when inserting some immutable log records, it is useless, and in this case, the index.index_insert_only settings optimize the Cassandra storage. In Elassandra, Cassandra is basically the data storage layer and by default, removing an index does not remove the underlying Cassandra table and keyspace. You can alter it with the index.drop_on_delete_index setting, removing the last index on a table will remove the underlying Cassandra table. Thus, purging Elasticsearch indices will also drop underlying keyspaces automatically. In Elassandra, data replication is no longer done by Elasticsearch, but by Cassandra itself. Then, the underlying keyspace replication map controls the location (which houses the Cassandra datacenters) and the number of copies. The index.replication setting in the Elasticsearch template defines the Cassandra replication map, here on DC1 with 2 copies. The table_options settings defines the Cassandra table options used at creation time. Here, as log records are immutable, we have chosen the Time Window Compactio Strategy designed for time series data. Your cloud is also set to Cassandra default TTL or compression settings (LZ4 by default). In Elassandra, the coordinator node distributes sub-queries to available nodes according to the search strategy defined by a search_strategy_class. By default, the PrimaryFirstSearchStrategy send a sub-query to all nodes in the Cassandra datacenter. Here, we use the RandomSearchStrategy that computes the smallest set of nodes required to get a consistent result in the datacenter. For example, with a replication factor of 2 in a 6-nodes cluster, this strategy only requests 3 nodes, reducing the global load of the cluster. To achieve this, an Elasticsearch pipeline transforms the original JSON documents to add a new unique timestamp stored as a timeuuid (a Type 1 UUID), and build a document _id in the form of a Cassandra compound key with the Docker container ID as the partition key, and the new timeuuid as a clustering key. We also add the index settings index.index_static_columns:true in order to index Cassandra static columns with each rows. After cleaning the existing index and redeploying the new Elasticsearch pipeline and template, the SSTables contains one wide row per container and per day. 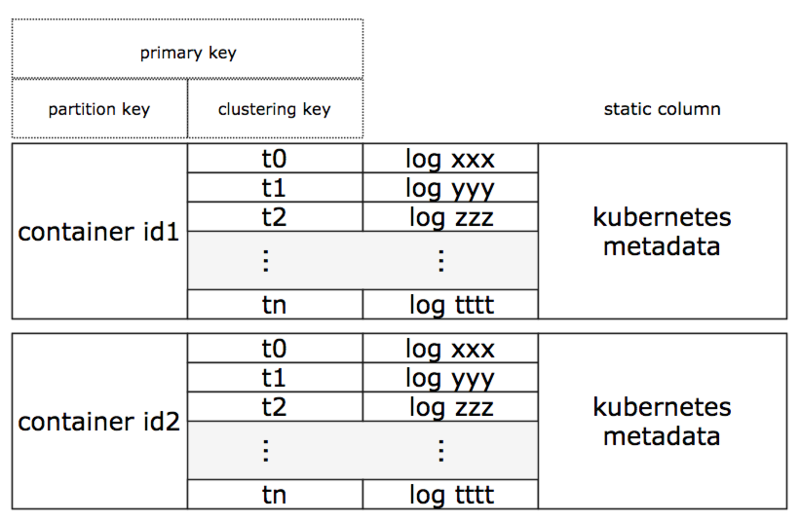 The log storage is now optimal and Kubernetes metadata is only stored once per day for each docker container. Even timestamp fields (es_time and time) can be removed because some time is freed up for the Cassandra clustering key, a timeuuid column seen as a date by Elasticsearch. 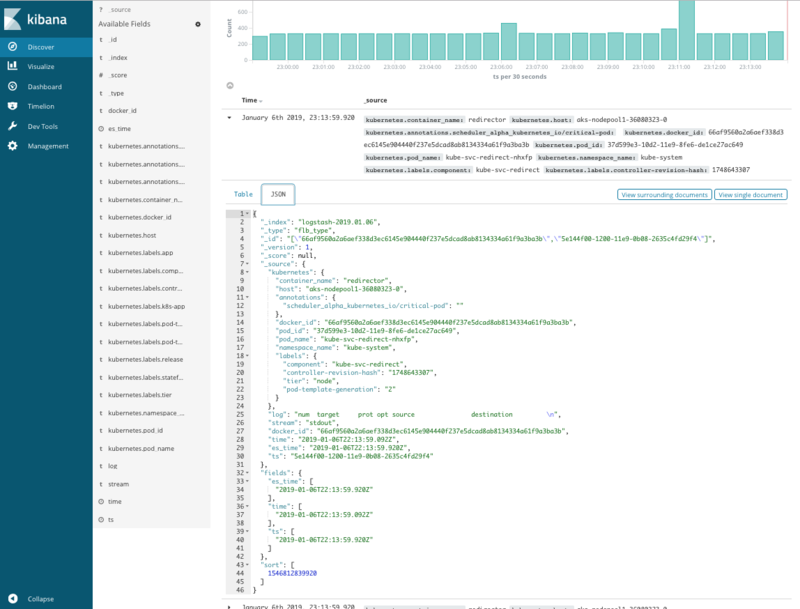 You can then use Kibana, as usual, to explore your logs and create dashboards. In order to check the availability of Elassandra, we have ingested some logs with a log generator. Then, we have killed an Elassandra pod, causing the node to be restarted by the Kubernetes controller. Connected to elassandra at 127.0.0.1:9042. During the same test, Fluent-Bit indicated some broken connection errors but managed and succeeded to write to Elassandra. [2019/01/10 16:57:39] [error] [http_client] broken connection to elassandra-elasticsearch.default.svc.cluster.local:9200 ? Thanks to the Cassandra multi-master architecture, write operations were made possible on at least one node while one was restarting, even through the Elasticsearch API! While a node was missing, the Elasticsearch indices became yellow, indicating there was a missing node, but the search was still consistent. After the node restarted, the Elasticsearch indices switched back to green and the Cassandra nodes 0 and 2 sent hint handoff to node 1 to recover from the missed log records. Elassandra presents an efficient new opportunity with Kuberentes for many use-cases. As demonstrated, with the right configuration, you can use the Elasticsearch pipeline processors to change or optimize the Cassandra storage, even if you don't index at all in Elasticsearch (just say index=no in your Elasticsearch mapping, and you will only get the data in the underlying Cassandra table). And furthermore, you can maintain your Elassandra clusters with no downtime when rolling upgrades or easily scale up/down Elassandra, with no need to re-index at all. Finally, Elassandra will support the cross-Kubernetes cluster replication in multi-cloud environments, but that's another story!